You will most likely notice a new and improved format used in your Monthly Rankings Reports, starting today. Most significant is that these reports are now run on the FIRST WEDNESDAY of each month, not the first day. The 1st page (Search Engine Comparison) shows your targeted search phrases and how they rank today in the major search engines (Google, Bing, Yahoo & Google Local). The 2nd page (Visibility) shows your Visibility Score (higher is better), how many phrases are in the Top 10, how many moved up / down, how many were dropped or added to search results and the overall net gain / loss. I will be updating this page ( https://www.richswebdesign.com/search-engine-ranking-reports/ ) to further explain each section of these reports, but if you have any questions, do not hesitate to call me. 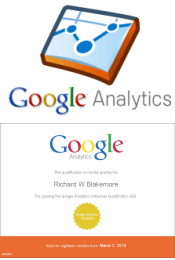 As a client of Rich’s Web Design you will be receiving a monthly report from Google Analytics in PDF format around the first day of each month. Google Analytics is the industry’s leading web statistics application that will show you valuable statistics (good and bad) about visitors to your own web site. 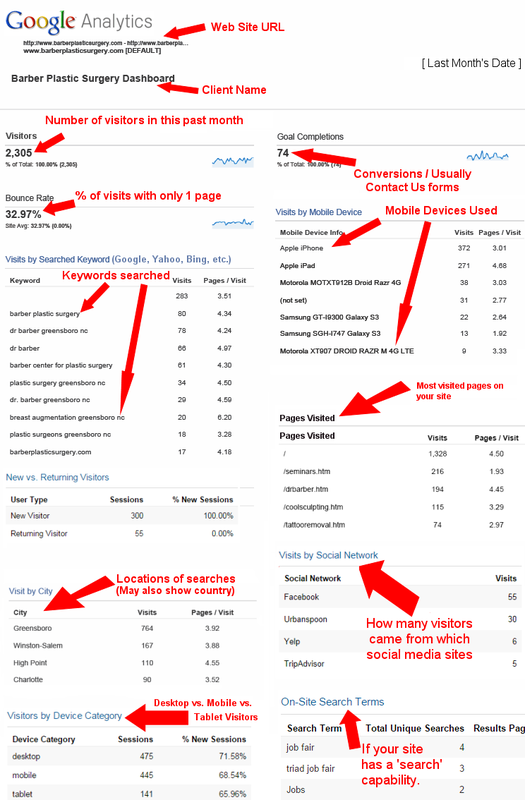 Each Google Analytics report will show you the number of visitors your site received the previous month, what search phrases they used to find your site, how many visitors “bounced” (left after only viewing 1 page), how many people filled out your Contact Us form (if applicable), percentage of mobile devices used to view your site, what inner pages have been visited, what cities / countries your visitors originated from, what social media sites sent visitors and other details. If you see ‘there is no data’, that means that you need to make more posts on Facebook, etc. with links to your web site; In other words you need to use Facebook, Twitter, LinkedIn, Yelp, etc. to help drive traffic to your site! If your WordPress site has a ‘Site Search’ capability, then the terms that your visitors search for will show up in the ‘On-Site Search Terms’ box. These are NOT from Google, but within your own site. If you have an e-commerce site, this report will show you purchase metrics, purchases, avg. cost, etc. If you see in any section of these reports ‘not provided’, this simply means that … the user / searcher is signed in to a Google account, or using the Firefox search bar. This can be a bit frustrating, as it can be a large portion of your ‘Search Term’ statistics. Google has their own reason why they do not want Google Analytics to share this information in the reporting metrics. As you can see in the below example, the ‘(not provided)’ line is the largest in the ‘Searched Keywords’ section. For those of you who have ‘Contact Us’ types of forms on your site, it will show you how many people sent you these. These are shown on your report as “Goal Conversions”. BELOW you will see an example of a client report with RED arrows and explanations in RED so that each section is very understandable. Take a look! I hope these monthly Google Analytics Dashboard reports will show you valuable stats about visitors to your site and what phrases we can emphasize differently. Please take just a little bit of time to view these, as this is valuable information about YOUR BUSINESS! You may not understand the first month’s reports, but once you receive 3 or 4, they will really start to make sense. Gavity Forms – Gravity Forms excels at complex forms with unique requirements. Contact Form 7 – Widely used, very popular Contact Form Plugin – best for simple to medium complexity forms. WP Classic Editor – If you don’t like the new Gutenberg Editor, or it’s incompatible with your site in some way, you can install the “Classic Editor” plugin to revert back to the pre-version 5.0 editor. UpdraftPlus Backups or BackupBuddy – For regular backups of your content. WP Cleanup Optimizer – Clean up comments, old drafts, revisions and dead posts. W3 Total Cache – can improve WordPress Load Time dramatically by caching the database and page requests on your site. Image compression plugins – Smush, EWWW, Kraken.io, ShortPixel or for manual folks, PicResize. Yoast SEO – We highly recommend using the Yoast SEO WordPress Plugin for generating your Open Graph meta tags. WordFence – With over 2 million installations, WordFence is definitely one of the most popular and trusted WordPress Security Plugins. reCAPTCHA – This is to add captcha to your website forms to reduce spam and abuse. Login Lockdown – Extra security for multiple logins. Instagram Feed WD – Displays an Instagram feed on your site. Child Theme Configurator – sets up a child theme. Charitable – gives you complete control with your WordPress fundraising efforts. Compact WP Audio Player – embed mp3 audio files on your site. Html5 Audio Player – Another audio player option. WordPress Charts and Graphs Lite OR Gravity Forms Charts Reports – create, manage and embed interactive charts. Google Website Translator – adds to Google’s own built-in tool. User Role Editor – lets you adjust user roles and capabilities with ease. Members ! – able to smoothly control permissions beyond what WordPress can do. unlimited number of responsive maps directly to your site through shortcodes. Easy Property Listing – the most feature-rich real estate plugin on the market.